Panama City has many neighborhoods that a foreign retire would find comfortable–Costa del Este, Casco Viejo, and Punta Pacifica, among others. All of these neighborhoods have their benefits and drawbacks, but few are as central, as eclectic, as welcoming, as interesting, and, in the current market, as affordable as El Cangrejo. El Cangrejo (“The crab”) sits between the prestigious La Cresta and Obarrio neighborhoods, and some say that the place was named for the way the quiet, tree-lined streets protrude from Via Argentina, like the limbs of a crab. El Cangrejo is a popular relocation choice among young entrepreneurial expats and retirees who want a neighborhood with character and countless amenities–banks, hospitals, restaurants, casinos, and nighclubs, all within walking distance. 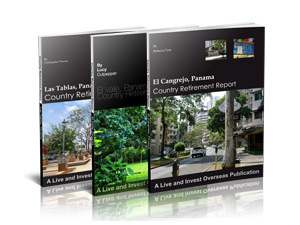 Each Special Panama Report from Live and Invest Overseas includes an honest, current, and complete introduction to one of the places we’ve identified as offering tremendous advantages for the would-be retiree, investor, or part-timer in Panama. Every comprehensive Special Panama Report addresses not only the pros, but also the cons of each destination featured. This is critical if you want to make a smart, informed choice. You’d be hard-pressed to find this information anywhere else in the world. Our Special Panama Reports arm you with all the tips, tricks, and firsthand insider intelligence you’ll need to decide whether a place could be home for you or not. Every report includes broad budget comparisons, insights into the communities and how your life would be within them, and much, much more. With this monthly membership service, Panama Letter, we bring you the real Panama, warts and all. This is your chance to discover what it is really like to live in this country, without the sugar coating. This is the good, the bad, and the ugly, brought to you by a team of insiders, with, among them, decades of firsthand experience living, investing, and doing business in Panama. Understand, with their help the opportunities that are right for you in the world’s top retirement, lifestyle, investment, doing-business, and embarking-on-a-new-adventure haven. Each monthly issue spotlights a different top choice in Panama, from Panama City to Las Tablas, from Santa Fe to Boquete. Glossy magazines and websites tell you the best of Panama; we introduce you to all Panama. Panama is the world’s #1 retirement haven…and an international tax haven. As a foreign resident, you can pay zero local tax, and Panama’s pensionado program of special benefits for foreign retirees is the Gold Standard. Panama is also one of the best places in the world right now to start a business. Get everything we publish on Panama for free- for a lifetime- if you become a Panama Circle Member. Find out how you can become a Panama Circle Member here.